Peugeot’s story begins in 1810, the year that Émile and Armand Peugeot converted their family’s flour mill to steel. They began making tools, watch and clock mechanisms as well as corset stays, sewing machines and irons. In 1840, Peugeot produced their first coffee mill. The pepper grinder, a Peugeot invention, arrived two years later, using a patented milling system with the company’s lion emblem on the grinder. The lion was first developed for Peugeot in 1850, trademarked in 1958 and its original, intricate design has been revamped over the decades. Peugeot later created washing machines, radios and the first food processor, the Peugimix. Peugeot pepper mills are widely regarded as the best in the industry. The made-to-last helix-shaped teeth grip the peppercorns as they’re ground, each one cracked in half before the grinding starts. This is the same technology used to produce ball bearings. 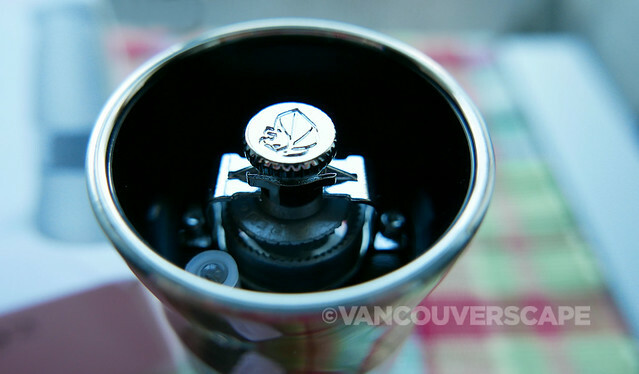 The knob on the bottom allows for adjusting grind size, from crushed corns for steak to finely ground for delicate sauces. Peugeot recommends using hard, whole peppercorns (white, black and dry green) six mm (1/4”) or less in diameter. If you’re using pink berries, make sure there’s 15% (max) of them in the peppercorn blend. 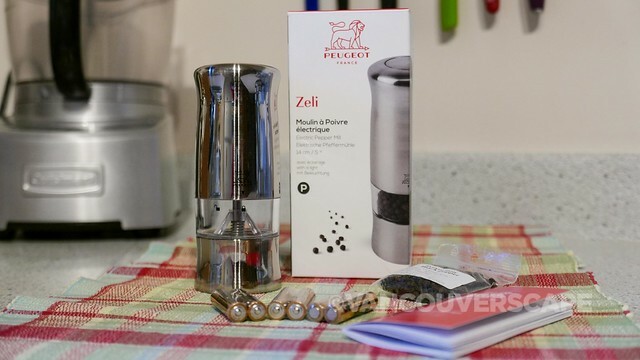 We recently received Peugeot’s Zeli Electric Pepper Mill to test drive. 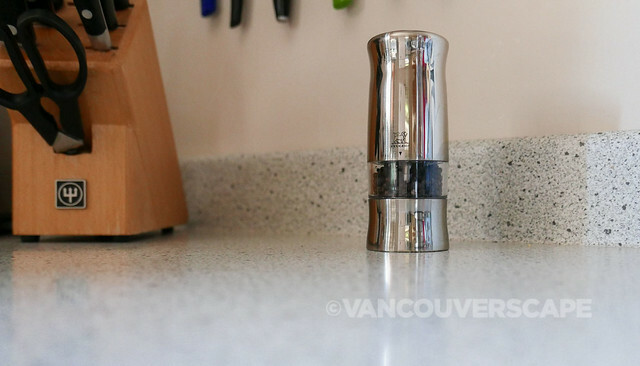 The design is sleek with a brushed metal finish. It’s compact too, at 14 cm (5.5”) tall. Set-up is pretty easy: just remove the motor unit from the reservoir, insert six AAA batteries around each side of the compartment, slide the two side notches to lock the mechanism into place inside the unit and reunite the unit with the mill section. 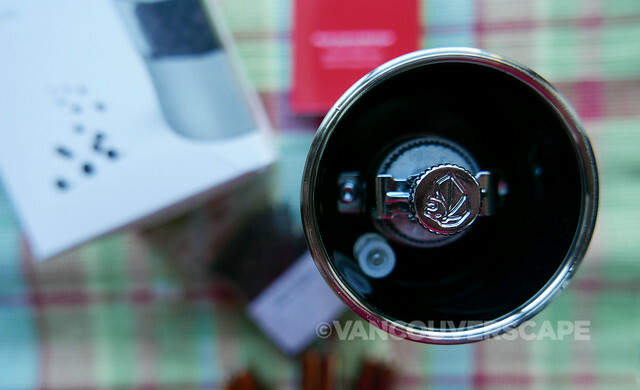 The clear plastic reservoir twists open for filling, with lock and unlock markings plus an arrow above to indicate whether the pepper mill’s open or shut. There’s even a light that comes on when you push down on the button at top, ideal for romantic candlelight suppers and camping trips alike. 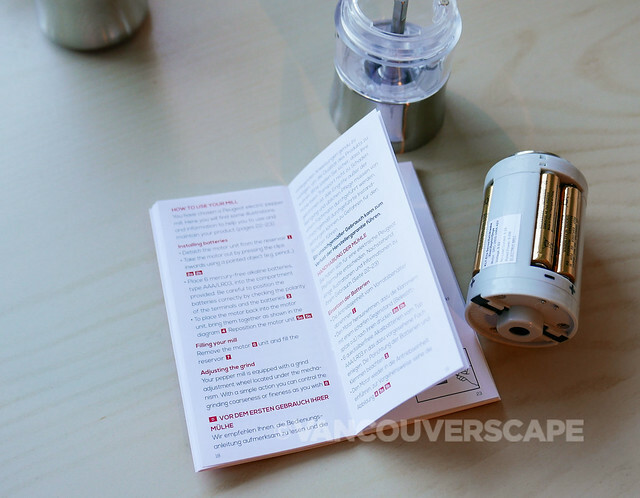 The box contains six batteries, the pepper mill, a user guide plus a spare bulb. 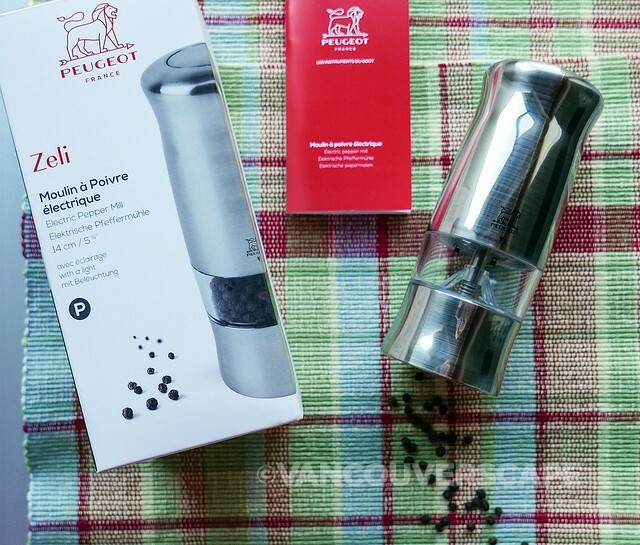 Pepper mill designs have come a long way and we’re happy to have a sleek and modern Peugeot pepper mill gracing our dining table. We like to create our own pepper mixes but if you’re feeling fancy, Peugeot carries a selection of gourmet peppercorns from Vietnam, Madagascar, Cambodia and Nepal online. The Zeli retails for USD $62; there’s also a matching electric salt mill available for the same price. The mill itself is guaranteed for two years however the grinding mechanism carries a lifetime warranty. Visit Peugeot’s website for details and ordering.